Is That Legal? revised edition – now multilingual! 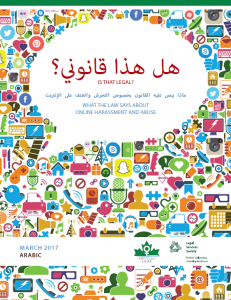 This plain language legal guide was developed for youth as part of our Legal Responses to Cyber Misogyny project. 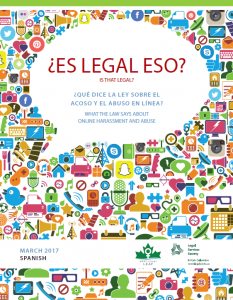 It explains what the law says about five common online situations that young people may experience. Is That Legal? 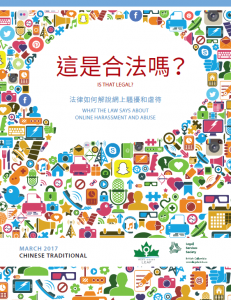 was originally published in June 2014, and we were delighted to have the opportunity to create a thoroughly revised 2017 edition with the support and collaboration of Legal Services Society. 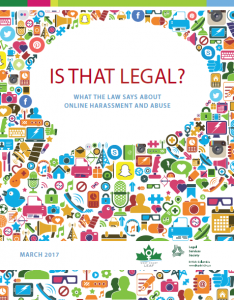 The 2017 edition contains updates to the law, features an expanded section on consent, uses plainer language, and integrates the feedback of youth and service providers. A big thanks to all who shared their knowledge and vision throughout this project! 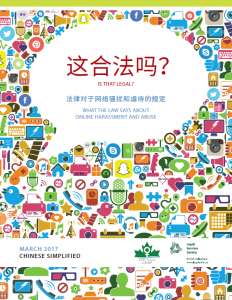 Download the English PDF version of Is That Legal? here. Exciting news! As of March 2018, Is That Legal? is available in Arabic, Chinese Simplified, Chinese Traditional, Punjabi, and Spanish, in addition to English! Huge thanks to Legal Services Society for funding the translations and partnering with West Coast LEAF to produce Is That Legal? in languages other than English. Download the PDF versions by clicking on the images or links below, or order print copies from Crown Publications! Individuals may order one free print copy. Organizations wishing to order multiple copies must first apply for an account with Legal Services Society. To apply for an account, please complete this Application Form or fax a Customer Account Application Form to 604-682-0965. When your application is accepted, you’ll receive your customer ID.